Built on the process featured in Common Formative Assessment: A Toolkit for PLCs at Work™, this book demonstrates how educators can develop effective and efficient assessments. The authors simplify assessment development to give teacher teams the confidence to write and use team-designed common formative assessments that help ensure all students master essential skills and concepts. Bailey, K., & Jakicic, C. (2012). 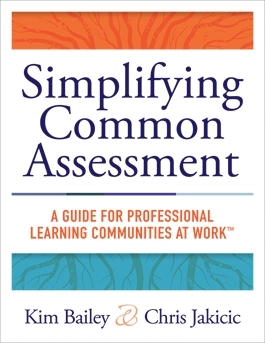 Common Formative Assessment: A Toolkit for Professional Learning Communities at Work. Bloomington, IN: Solution Tree Press. Bailey, K., Jakicic, C., & Spiller, J. (2014). Collaborating for Success With the Common Core: A Toolkit for Professional Learning Communities at Work. Bloomington, IN: Solution Tree Press. Buffum, A., & Mattos, M. (Eds.). (2015). It’s About Time: Planning Interventions and Extensions in Elementary School. Bloomington, IN: Solution Tree Press. Mattos, M., & Buffum, A. (Eds.). (2015). It’s About Time: Planning Interventions and Extensions in Secondary School. Bloomington, IN: Solution Tree Press.